Individuals with allergic contact dermatitis (see the image below) may have persistent or relapsing dermatitis, particularly if the material(s) to which they are allergic is not identified or if they practice inappropriate skin care. The longer an individual has severe dermatitis, the longer, it is believed, that the dermatitis will take to resolve once the cause is identified. Chronic stasis dermatitis with allergic contact dermatitis to quaternium-15, a preservative in moisturizer. 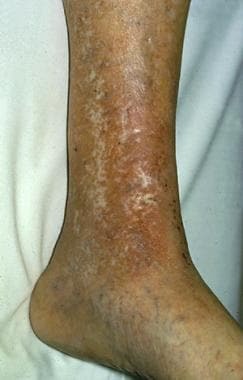 Allergic contact dermatitis produces areas of erythema in areas of atrophie blanche and varicose veins. Acute allergic contact dermatitis is characterized by pruritic papules and vesicles on an erythematous base. Lichenified pruritic plaques may indicate a chronic form of the condition. Individuals with allergic contact dermatitis typically develop the condition within a few days of exposure, in areas that were exposed directly to the allergen. Certain allergens (eg, neomycin), however, penetrate intact skin poorly; in such cases, the onset of dermatitis may be delayed for up to a week following exposure. Individuals may develop widespread dermatitis from topical medications applied to leg ulcers or from cross-reacting systemic medications administered intravenously. Intraoral metal contact allergy may result in mucositis that mimics lichen planus, which has an association with intraoral squamous cell carcinoma. Allergic contact dermatitis (ACD) is a delayed type of induced sensitivity (allergy) resulting from cutaneous contact with a specific allergen to which the patient has developed a specific sensitivity. This allergic reaction causes inflammation of the skin manifested by varying degrees of erythema, edema, and vesiculation. The term contact dermatitis sometimes is used incorrectly as a synonym for allergic contact dermatitis. Contact dermatitis is inflammation of the skin induced by chemicals that directly damage the skin (see Irritant Contact Dermatitis) and by specific sensitivity in the case of allergic contact dermatitis. Jadassohn first described allergic contact dermatitis in 1895. He developed the patch test to identify the chemicals to which the patient was allergic. Sulzberger popularized patch testing in the United States in the 1930s. The Finn chamber method for patch testing was designed in the 1970s; these chambers consist of small metal cups, typically attached to strips of tape, filled with allergens dispersed in either petrolatum or water. The thin-layer rapid use epicutaneous (TRUE) test for patch testing became available in the United States in the 1990s. The importance of specific substances as causes of allergic contact dermatitis varies with the prevalence of that substance in the environment. Mercury compounds once were significant causes of allergic contact dermatitis but rarely are used as topical medications and, currently, are uncommon as a cause of allergic contact dermatitis. Ethylenediamine, which was present in the original Mycolog cream, declined as a primary cause of allergic contact dermatitis once Mycolog cream was reformulated to no longer contain this allergen. Go to Irritant Contact Dermatitis, Pediatric Contact Dermatitis, and Protein Contact Dermatitis for complete information on these topics. Approximately 3000 chemicals are well documented as specific causes of allergic contact dermatitis. Compounds must be less than 500 d for efficient penetration through the stratum corneum barrier, which is the water-impermeable outer layer of the skin. Small organic molecules that are chemically reactive (chemical sensitizers) bind with self-proteins to generate immunogenic neoantigens through a process termed haptenization. Although haptens can penetrate through intact skin, patients with certain disease states that impair barrier function (eg, leg ulcers, perianal dermatitis) have an increased risk of sensitization to topically applied medications and their vehicle components. Many patients with atopic dermatitis or allergic contact dermatitis to nickel harbor a defective form of the filaggrin gene. Filaggrin helps aggregate cytoskeletal proteins that form the cornified cell envelope. In its absence, the barrier is defective. Prehaptens are chemicals that are not activated by host proteins, but instead require chemical transformation by oxidative derivatization by ambient or air oxidation to form hydroperoxide. Examples include certain fragrance materials and dyes used in hair coloring, such as para-phenylenediamine. Haptens activate Toll-like receptors (TLRs) and activate innate immunity. The importance of hapten-mediated activation of innate immunity is highlighted by the clinical observation that the irritancy of chemicals (ie, the ability of these chemicals to cause grossly visible skin inflammation upon primary exposure) correlates with their ability to act as contact sensitizers and to induce acute contact dermatitis. Haptens or haptenated self-proteins are recognized by innate immune mechanisms in the skin, and this leads to the elaboration of a number of proinflammatory mediators, including interleukin (IL)–1β. As a result, skin-resident dendritic cells (DCs) become activated. There are several populations of DCs. Langerhans cells are the only DC subtype in the epidermis. Like all skin-resident DCs, Langerhans cells efficiently acquire antigen in the periphery and migrate to regional lymph nodes where they present antigen to naïve and memory T cells. These DCs, which may have been directly haptenated or could have acquired haptenated proteins from their surroundings, migrate to skin-draining lymph nodes where they present peptides from haptenated proteins to activate memory and naïve T cells. In the final step, hapten-induced inflammation recruits activated effector T cells back to the initial site of antigen encounter in the skin. The effector T cells release proinflammatory cytokines, such as interferon-γ, and promote the killing of haptenated cells, resulting in the development of the classic inflammatory rash seen in allergic contact dermatitis. The initial sensitization typically takes 10-14 days from initial exposure to a strong contact allergen such as poison ivy. Some individuals develop specific sensitivity to allergens following years of chronic low-grade exposure; for example, sensitivity to chromate in cement can eventually develop in individuals with chronic irritant contact dermatitis resulting from the alkaline nature of cement. Once an individual is sensitized to a chemical, allergic contact dermatitis develops within hours to several days of exposure. CD4+ CCR10+ memory T cells persist in the dermis after clinical resolution of allergic contact dermatitis. Approximately 25 chemicals appear to be responsible for as many as one half of all cases of allergic contact dermatitis. These include nickel, preservatives, dyes, and fragrances. Poison ivy (Toxicodendron radicans) is the classic example of acute allergic contact dermatitis in North America. Allergic contact dermatitis from poison ivy is characterized by linear streaks of acute dermatitis that develop where plant parts have been in direct contact with the skin. Allergic contact dermatitis to nickel typically is manifested by dermatitis at the sites where earrings or necklaces (see the image below) containing nickel are worn or where metal objects (including the keypads of some cell phones  ) containing nickel are in contact with the skin. Nickel may be considered a possible occupational allergen. Workers in whom nickel may be an occupational allergen primarily include hairdressers, retail clerks, caterers, domestic cleaners, and metalworkers. Individuals allergic to nickel occasionally may develop vesicles on the sides of the fingers (dyshidrotic hand eczema or pompholyx) from nickel in the diet. 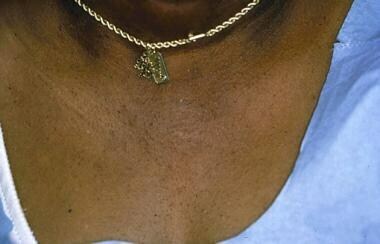 Allergic contact dermatitis to nickel in a necklace. Allergy to 1 or more chemicals in rubber gloves is suggested in any individual with chronic hand dermatitis who wears them, unless patch testing demonstrates otherwise. Allergic contact dermatitis to chemicals in rubber gloves typically occurs maximally on the dorsal aspects of the hand. Usually, a cutoff of dermatitis occurs on the forearms where skin is no longer in contact with the gloves. Individuals allergic to chemicals in rubber gloves may develop dermatitis from other exposures to the chemicals (eg, under elastic waistbands). Individuals allergic to dyes and permanent press and wash-and-wear chemicals added to textiles typically develop dermatitis on the trunk, which occurs maximally on the lateral sides of the trunk but spares the vault of the axillae. Primary lesions may be small follicular papules or may be extensive plaques. Individuals in whom this allergic contact dermatitis is suspected should be tested with a series of textile chemicals, particularly if routine patch testing reveals no allergy to formaldehyde. New clothing is most likely to provoke allergic contact dermatitis, since most allergens decrease in concentration in clothing following repeated washings. Preservative chemicals added to cosmetics, moisturizers, and topical medications are major causes of allergic contact dermatitis (see the image below). The risk of allergic contact dermatitis appears to be highest to quaternium-15, followed by allergic contact dermatitis to isothiazolinones. Methylisothiazolinone is used as an individual preservative and may be a significant allergen. Kathon CG is methylchloroisothiazolinone in combination with methylisothiazolinone. Although parabens are among the most widely used preservatives, they are not a frequent cause of allergic contact dermatitis. Severe allergic contact dermatitis resulting from preservatives in sunscreen. Patch testing was negative to the active ingredients in the sunscreen. Formaldehyde is a major cause of allergic contact dermatitis (see the image below). Certain preservative chemicals widely used in shampoos, lotions, other moisturizers, and cosmetics are termed formaldehyde releasers (ie, quaternium-15 [Dowicil 200], imidazolidinyl urea [Germall 115], and isothiazolinones  ). They are, in themselves, allergenic or may produce cross-sensitization to formaldehyde. 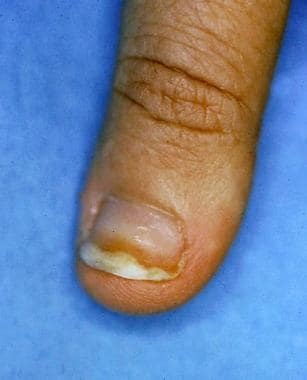 Onycholysis developing from allergic contact dermatitis to formaldehyde used to harden nails. Individuals may develop allergy to fragrances. Fragrances are found not only in perfumes, colognes, aftershaves, deodorants, and soaps, but also in numerous other products, often as a mask to camouflage an unpleasant odor. Unscented products may contain fragrance chemicals used as a component of the product and not labeled as fragrance. Individuals allergic to fragrances should use fragrance-free products. Unfortunately, the exact chemicals responsible for a fragrance in a product are not labeled. Four thousand different fragrance molecules are available to formulate perfumes. The fragrance industry is not required to release the names of ingredients used to compose a fragrance in the United States, even when individuals develop allergic contact dermatitis to fragrances found in topical medications. Deodorants may be the most common cause of allergic contact dermatitis to fragrances because they are applied to occlude skin that is often abraded by shaving in women. Massage and physical therapists and geriatric nurses are at higher risk of occupational allergic contact dermatitis to fragrances. In the last decade, it has become clear that some individuals with chronic dermatitis develop allergy to topical corticosteroids. Most affected individuals can be treated with some topical corticosteroids, but an individual can be allergic to all topical and systemic corticosteroids. Budesonide and tixocortol pivalate are useful patch test corticosteroids for identifying individuals allergic to topical corticosteroids. The risk of allergy to neomycin is related directly to the extent of its use in a population. The risk of allergy to neomycin is much higher when it is used to treat chronic stasis dermatitis and venous ulcers than when it is used as a topical antibiotic on cuts and abrasions in children. Assume that individuals allergic to neomycin are allergic to chemically related aminoglycoside antibiotics (eg, gentamicin, tobramycin). Avoid these drugs both topically and systemically in individuals allergic to neomycin. Avoid topical use of benzocaine. Benzocaine is included in most standard patch test trays. Individuals allergic to benzocaine may safely use or be injected with lidocaine (Xylocaine), which does not cross-react with benzocaine. Many individuals complain of adverse reactions to sunscreens, but many of these individuals are not allergic to the sunscreen materials. They may be allergic to preservatives in these products or may have nonspecific cutaneous irritation from these products. Occasionally, individuals develop photoallergic contact dermatitis. Allergic contact dermatitis may be accentuated by ultraviolet (UV) light, or patients may develop an allergic reaction only when a chemical is present on the skin and when the skin is exposed sufficiently to ultraviolet light A (UV-A; 320-400 nm). These agents are used in manufacturing, nail acrylics, and wound dressings, among other uses. The National Health and Nutrition Examination Survey (NHANES) estimated the prevalence of contact dermatitis to be 13.6 cases per 1000 population, using physical examinations by dermatologists of a selected sample of patients. NHANES underreported the prevalence compared with the physical examination findings. The National Ambulatory Medical Care Survey conducted in 1995 estimated 8.4 million outpatient visits to American physicians for contact dermatitis. This was the second most frequent dermatologic diagnosis. Of office visits to dermatologists, 9% are for dermatitis. At a student health center dermatology clinic, 3.1% of patients presented for allergic contact dermatitis, and 2.3% presented for irritant contact dermatitis. The TRUE test Web site can provide accurate basic information on common allergens. The Contact Allergen Management Program is provided as a service to the American Contact Dermatitis Society (ACDS) members and is particularly valuable for allergens found in topical skin care products. The Contact Allergen Management Program (CAMP) database contains more than 8100 known ingredients cataloged in more than 5500 commercial skincare products and is available as a Smartphone application. A Swedish study found that prevalence of allergic contact dermatitis of the hands was 2.7 cases per 1000 population. A Dutch study found that prevalence of allergic contact dermatitis of the hands was 12 cases per 1000 population. No racial predilection exists for allergic contact dermatitis. Allergic contact dermatitis is more common in women than in men. This predominantly is a result of allergy to nickel, which is much more common in women than in men in most countries. Individuals with allergic contact dermatitis may have persistent or relapsing dermatitis, particularly if the material(s) to which they are allergic is not identified or if they continue to practice skin care that is no longer appropriate (ie, they continue to use harsh chemicals to wash their skin, they do not apply creams with ceramides or bland emollients to protect their skin). The longer an individual has severe dermatitis, the longer it is believed it will take the dermatitis to resolve once the cause is identified. Some individuals have persistent dermatitis following allergic contact dermatitis, which appears to be true especially in individuals allergic to chromates. A particular problem is neurodermatitis (lichen simplex chronicus), in which individuals repeatedly rub or scratch an area initially affected by allergic contact dermatitis. Death from allergic contact dermatitis is rare in the United States. Allergic contact dermatitis to the weed wild feverfew caused deaths in India when the seeds contaminated wheat shipments to India. This plant then became widespread and a primary cause of severe airborne allergic contact dermatitis. Patients have the best prognosis when they are able to remember the materials to which they are allergic and how to avoid further exposures. Provide patients with as much information as possible concerning the chemical to which they are allergic, including all known names of the chemical. Web sites, Smartphone applications, standard textbooks, and the TRUE test kit contain basic information about the chemicals. Susceptible individuals need to read the list of ingredients before applying cosmetic products to their skin, since preservative chemicals are used widely in consumer, medical, and workplace products. The same chemical may have different names when used for consumer or industrial purposes. Provide pamphlets with color pictures of poison ivy to individuals allergic to the plant. The American Academy of Dermatology also has pamphlets on allergic contact dermatitis and hand eczema. For patient education information, see the Skin, Hair, and Nails Center, as well as Contact Dermatitis. Novak N, Baurecht H, Schafer T, Rodriguez E, et al. Loss-of-function mutations in the filaggrin gene and allergic contact sensitization to nickel. J Invest Dermatol. 2008 Jun. 128(6):1430-5. [Medline]. Lu LK, Warshaw EM, Dunnick CA. Prevention of nickel allergy: the case for regulation?. Dermatol Clin. 2009 Apr. 27(2):155-61, vi-vii. [Medline]. Thyssen JP, Linneberg A, Menne T, Nielsen NH, Johansen JD. Contact allergy to allergens of the TRUE-test (panels 1 and 2) has decreased modestly in the general population. Br J Dermatol. 2009 Nov. 161(5):1124-9. [Medline]. Moennich JN, Zirwas M, Jacob SE. Nickel-induced facial dermatitis: adolescents beware of the cell phone. Cutis. 2009 Oct. 84(4):199-200. [Medline]. Ponten A, Hamnerius N, Bruze M, et al. Occupational allergic contact dermatitis caused by sterile non-latex protective gloves: clinical investigation and chemical analyses. Contact Dermatitis. 2013 Feb. 68(2):103-10. [Medline]. Jacob SE, Zapolanski T, Chayavichitsilp P, Connelly EA, Eichenfield LF. p-Phenylenediamine in black henna tattoos: a practice in need of policy in children. Arch Pediatr Adolesc Med. 2008 Aug. 162(8):790-2. [Medline]. Thyssen JP, White JM. Epidemiological data on consumer allergy to p-phenylenediamine. Contact Dermatitis. 2008 Dec. 59(6):327-43. [Medline]. Lundov MD, Krongaard T, Menne TL, Johansen JD. Methylisothiazolinone contact allergy: a review. Br J Dermatol. 2011 Dec. 165(6):1178-82. [Medline]. Schnuch A, Mildau G, Kratz EM, Uter W. Risk of sensitization to preservatives estimated on the basis of patch test data and exposure, according to a sample of 3541 leave-on products. Contact Dermatitis. 2011 Sep. 65(3):167-74. [Medline]. Brared Christensson J, Andersen KE, Bruze M, et al. Air-oxidized linalool: a frequent cause of fragrance contact allergy. Contact Dermatitis. 2012 Nov. 67(5):247-59. [Medline]. Niklasson IB, Delaine T, Islam MN, Karlsson R, Luthman K, Karlberg AT. Cinnamyl alcohol oxidizes rapidly upon air exposure. Contact Dermatitis. 2013 Mar. 68(3):129-38. [Medline]. Guin JD, Phillips D. Erythroderma from systemic contact dermatitis: a complication of systemic gentamicin in a patient with contact allergy to neomycin. Cutis. 1989 Jun. 43(6):564-7. [Medline]. Green CM, Holden CR, Gawkrodger DJ. Contact allergy to topical medicaments becomes more common with advancing age: an age-stratified study. Contact Dermatitis. 2007 Apr. 56(4):229-31. [Medline]. Rashid RS, Shim TN. Contact dermatitis. BMJ. 2016 Jun 30. 353:i3299. [Medline]. Assier-Bonnet H, Revuz J. [Topical neomycin: risks and benefits. Plea for withdrawal]. Ann Dermatol Venereol. 1997. 124(10):721-5. [Medline]. Gonul M, Gul U. Detection of contact hypersensitivity to corticosteroids in allergic contact dermatitis patients who do not respond to topical corticosteroids. Contact Dermatitis. 2005 Aug. 53(2):67-70. [Medline]. Cohen LM, Cohen JL. Erythema multiforme associated with contact dermatitis to poison ivy: three cases and a review of the literature. Cutis. 1998 Sep. 62(3):139-42. [Medline]. Cohen DE, Brancaccio R, Andersen D, Belsito DV. Utility of a standard allergen series alone in the evaluation of allergic contact dermatitis: a retrospective study of 732 patients. J Am Acad Dermatol. 1997 Jun. 36(6 Pt 1):914-8. [Medline]. [Guideline] Bernstein IL, Li JT, Bernstein DI, et al. Allergy diagnostic testing: an updated practice parameter. Ann Allergy Asthma Immunol. 2008 Mar. 100(3 Suppl 3):S1-148. [Medline]. Larkin A, Rietschel RL. The utility of patch tests using larger screening series of allergens. Am J Contact Dermat. 1998 Sep. 9(3):142-5. [Medline]. Marks JG, Belsito DV, DeLeo VA, et al. North American Contact Dermatitis Group patch test results for the detection of delayed-type hypersensitivity to topical allergens. J Am Acad Dermatol. 1998 Jun. 38(6 Pt 1):911-8. [Medline]. Rajagopalan R, Anderson RT, Sarma S, et al. An economic evaluation of patch testing in the diagnosis and management of allergic contact dermatitis. Am J Contact Dermat. 1998 Sep. 9(3):149-54. [Medline]. Rastogi S, Patel KR, Singam V, Silverberg JI. Allergic contact dermatitis to personal care products and topical medications in adults with atopic dermatitis. J Am Acad Dermatol. 2018 Dec. 79 (6):1028-1033.e6. [Medline]. Rosa G, Fernandez AP, Vij A, Sood A, Plesec T, Bergfeld WF, et al. Langerhans cell collections, but not eosinophils, are clues to a diagnosis of allergic contact dermatitis in appropriate skin biopsies. J Cutan Pathol. 2016 Jun. 43 (6):498-504. [Medline]. Jacobs JJ, Lehe CL, Hasegawa H, Elliott GR, Das PK. Skin irritants and contact sensitizers induce Langerhans cell migration and maturation at irritant concentration. Exp Dermatol. 2006 Jun. 15(6):432-40. [Medline]. Taylor JS, Praditsuwan P, Handel D, Kuffner G. Allergic contact dermatitis from doxepin cream. One-year patch test clinic experience. Arch Dermatol. 1996 May. 132(5):515-8. [Medline]. Baeck M, Chemelle JA, Rasse C, Terreux R, Goossens A. C(16) -methyl corticosteroids are far less allergenic than the non-methylated molecules. Contact Dermatitis. 2011 Jun. 64(6):305-312. [Medline]. Katsarou A, Armenaka M, Vosynioti V, Lagogianni E, Kalogeromitros D, Katsambas A. Tacrolimus ointment 0.1% in the treatment of allergic contact eyelid dermatitis. J Eur Acad Dermatol Venereol. 2009 Apr. 23(4):382-7. [Medline]. Katsarou A, Makris M, Papagiannaki K, Lagogianni E, Tagka A, Kalogeromitros D. Tacrolimus 0.1% vs mometasone furoate topical treatment in allergic contact hand eczema: a prospective randomized clinical study. Eur J Dermatol. 2012 Mar-Apr. 22(2):192-6. [Medline]. 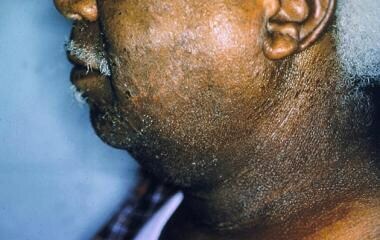 Verma KK, Bansal A, Sethuraman G. Parthenium dermatitis treated with azathioprine weekly pulse doses. Indian J Dermatol Venereol Leprol. 2006 Jan-Feb. 72(1):24-7. [Medline]. Shaffer MP, Belsito DV. Allergic contact dermatitis from glutaraldehyde in health-care workers. Contact Dermatitis. 2000 Sep. 43(3):150-6. [Medline]. Erythema multiformelike reaction that developed acutely following hair dying.